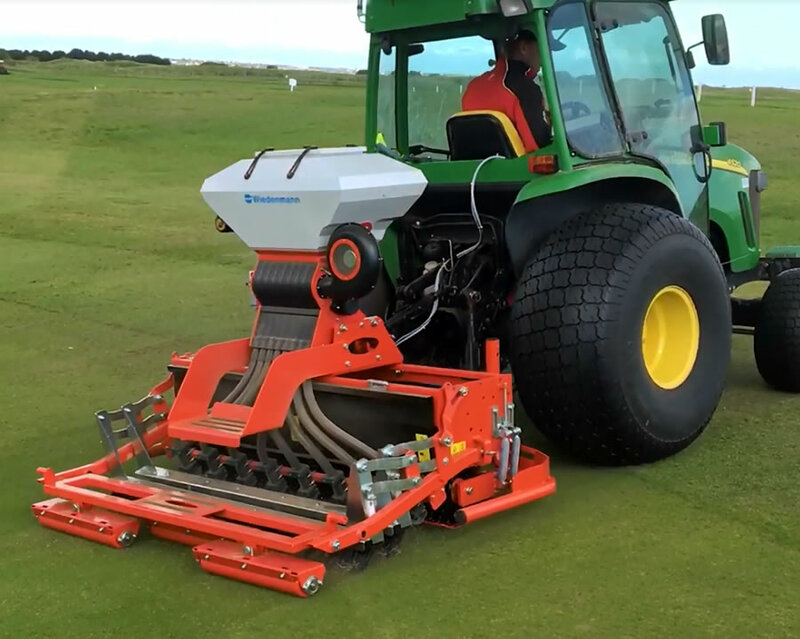 Three-in-one pneumatic seeder for golf greens, tees and sports fields. The distinctive-looking Terra Float Air pneumatic surface conditioner and overseeder offers maximum accuracy at quantities as little as 1 g / m². Its base unit aerates or loosens soil to 30 mm using a rotary spiker fitted with either 5 mm or 8 mm diameter spikes or stars. Next the top-mounted pneumatic air seeder assures a receptive seed bed either pre or post top dressing. Finally, a brush and roller combination incorporates top dressing materials to the ground before smoothing the surface. Very fine seed rollers mean exact calibration is achievable. Distribution of the seed is absolutely uniform via the air flow and deflector system. Seed is blown to the surface via 8 tubes and a distribution chute. Optional equipment: Sets of white or yellow brushes, brush load relieving kit, bogey wheels, seed box cover, additional dosing rollers. If you are interested in our TERRA FLOAT AIR use the quick enquiry form below.